This was published today in the BBC’s Magazine. I don’t think it requires further comment from me: the pictures and accompanying text tell their own story. The photographs of a three-year-old Syrian boy found dead on a beach in Turkey are among the most powerful to have emerged from Europe’s migrant crisis. But many other moving pictures have been taken over the years, illustrating the dangers of the migrants’ journey or the treatment they have received on arrival in Europe. 1. 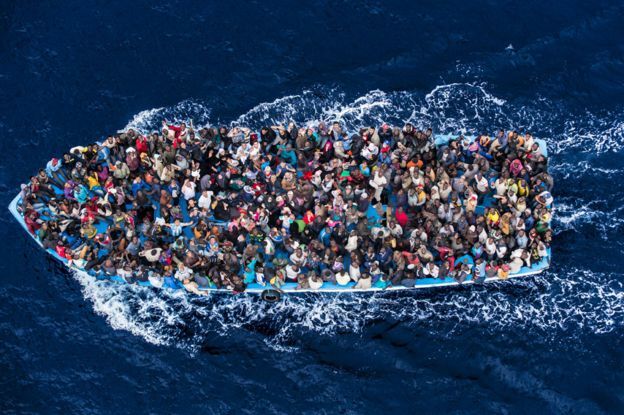 Juan Medina was working as a photographer for a local paper in the Canary Islands in 2004 when yet another small boat arrived, packed with men from sub-Saharan Africa. As a Spanish Civil Guard patrol approached, it capsized and nine men drowned. 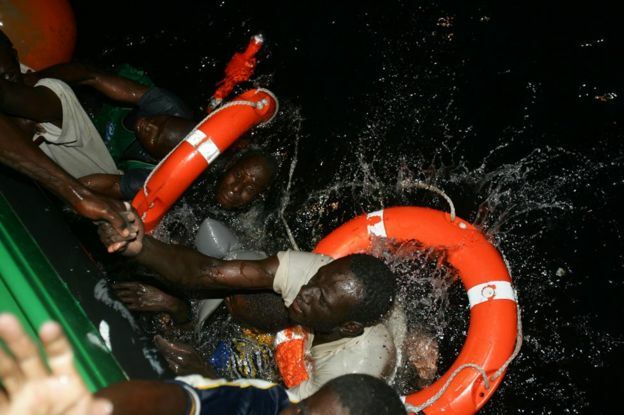 Medina photographed two of the 29 survivors, Isa and Ibrahim, both from Mali, as they were pulled from the water. The shot won him a World Press Photo award the following year. 2. The Canary Islands was still one of the main destinations for African migrants two years later. By this stage the boats were often leaving from Mauritania or even Senegal, instead of Morocco – a perilous journey across 1,000km of the Atlantic. 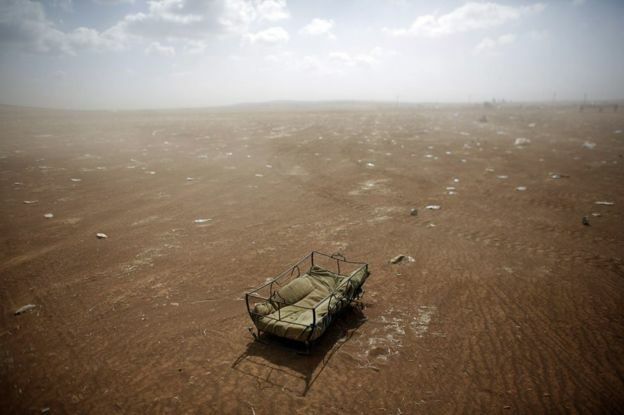 Many people arrived starving and dehydrated. This photograph taken on Tenerife’s La Tejita beach shows tourists trying to help a young boy, and earned Arturo Rodriguez a World Press Photo award in 2007. 3. Two tiny Spanish enclaves on Morocco’s Mediterranean coast, Ceuta and Melilla, exercise a magnetic attraction for people trying to reach Europe. Here the continent is just a razorwire fence away. 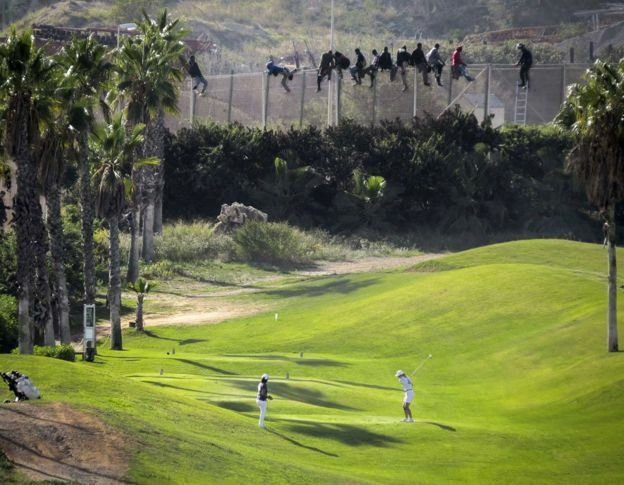 Jose Palazon, who works for migrant rights group Pro.De.In Melilla, took this picture of one golfer in mid-swing, while another gazes at a group of men (and one policeman) perched on the fence. “It seemed like a good moment to take a photo that was a bit more symbolic,” he told the El Pais newspaper. 4. 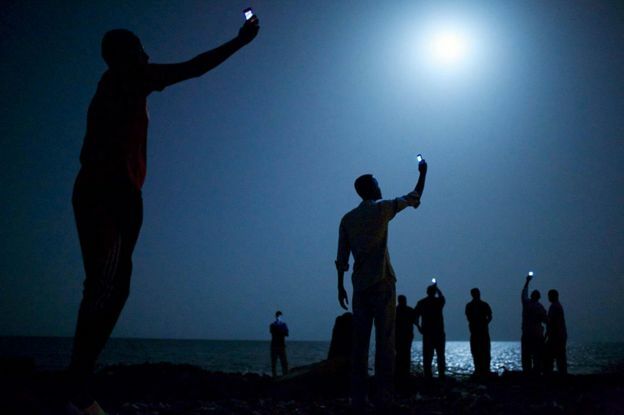 Migrants passing through Djibouti, on the Gulf of Aden, sometimes save money by buying a SIM card from neighbouring Somalia on the black market. Photographer John Stanmeyer met a group of them standing on the coast waiting to catch a faint signal. “It communicated the universality of all of us,” he says. “We really are standing at a crossroads of our collective humanity. Where are we going? What does it mean to be human?” The photograph won a World Press Photo award in 2014. 6. Massimo Sestini took this photograph from an Italian navy helicopter in 2014, but it was in fact a repeat of a shot he had taken in identical circumstances the year before. The new photograph, taken between Libyan and Italy, showed that nothing had changed – but was also more striking because of the behaviour of the passengers. “I thought if I could get the right angle straightaway, directly above 500 people who have spent five days and nights on a boat, they would probably all look up, ask for help, wave – so this year I thought I’d try again and it worked.” The shot won a World Press Photo award earlier this year. 7. 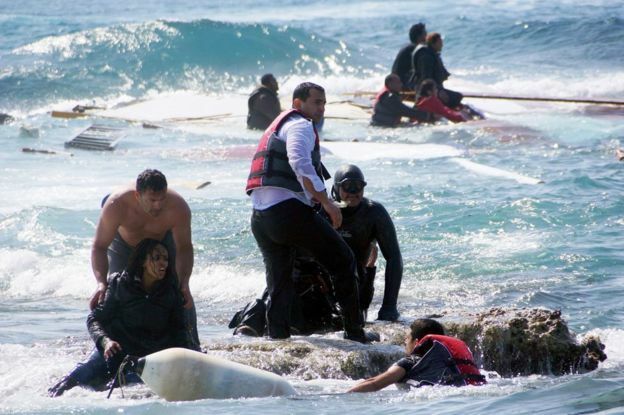 In April this year a wooden sailing boat carrying Syrians and Eritreans smashed on rocks as it attempted to land on the Greek island of Rhodes. Greek army sergeant Antonis Deligiorgis, who was having a coffee with his wife on the seafront, dived into the waves and rescued 20 of the 93 people on board singlehandedly. One was Wegasi Nebiat, a 24-year-old Eritrean, pictured being brought ashore by Deligiorgis, on the left of the picture. Another, a pregnant woman who later gave birth in Rhodes general hospital, told staff she would name her son after the man who had saved her. 8. 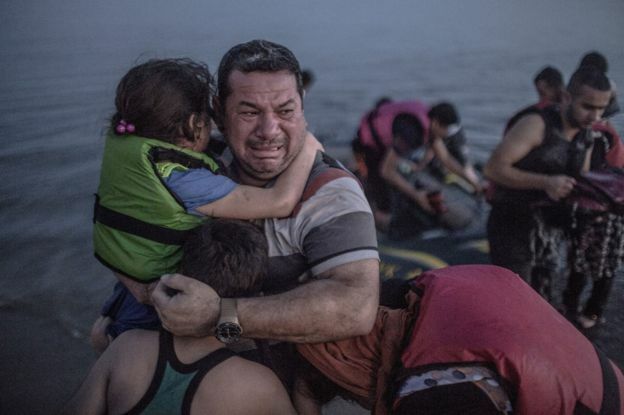 This photograph shows a Syrian man, Laith Majid, holding his son and daughter in his arms, after a journey from Turkey to the Greek island of Kos in an inflatable boat that been steadily losing air. “An entire country’s pain captured in one father’s face,” tweeted @MaryFitzger, after it was published in the New York Times. “I am overwhelmed by the reaction to this family’s tears of relief. This is why I do what I do,” wrote German photographer Daniel Etter. 9. When Macedonia closed its border to migrants last month, after declaring a state of emergency, thousands spent a night in no-man’s-land. The following morning they tried to push through police lines, leading officers to fire stun grenades into the crowd. 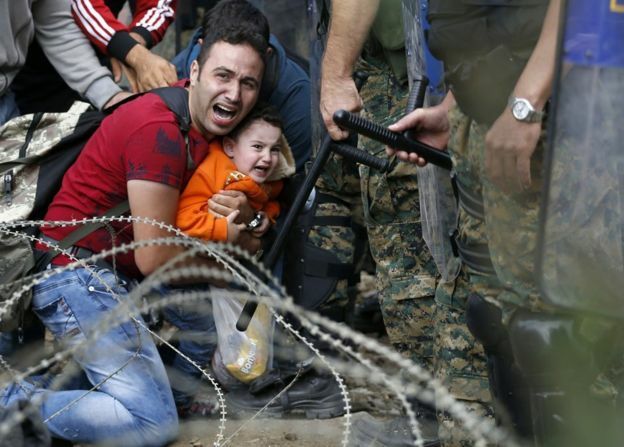 AP photographer Darko Vojinovic captured this young father’s despair. In the previous three weeks 39,000 migrants had been registered as they passed through the country en route for Serbia, and then Hungary – a member of the European Union. 10. This photograph went viral on social media a week ago. 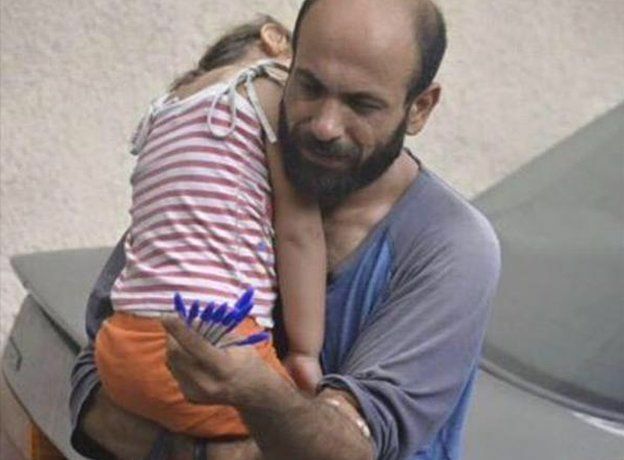 Who was the desperate man selling pens to support his family in the Lebanese capital Beirut, and how could people help him? He was quickly identified as Abdul Halim Attar, a Palestinian refugee from Yarmouk in Syria – and a crowdfunding campaign was launched on Indiegogo. It has already raised $181,000. Attar was overcome when he was told about the fund, says Gissur Simonarson, an Icelander who posted the original viral tweet. Attar’s goal is to set up an education fund for Syrian children – and to return home from Beirut as soon as this becomes possible. More than half of the people who have crossed the Mediterranean in the hope of settling in Europe this year have arrived in Greece – and most of those have landed on five Greek islands closest to the Turkish coast. Photographer Fernando Del Berro watched some arrive – shaken, euphoric, overflowing with emotion – on the northern shore of Lesbos.